This was a poorly-recorded state with uncertain borders. When its existence was first discovered by modern scholars its location was placed (in 1926) somewhere around the later region of Cilicia on the southern Anatolian coast. As more was discovered about Bronze Age Anatolian history so Arzawa's location moved further west until it settled (by 1959) in the south-western corner of Anatolia. There were some attempts up until the 1980s to move it back towards the east but these were unsuccessful and Arzawa's location in the south-west is now largely accepted. Arzawa (or Assuwa) appears to have been a large region which was composed of several principalities. It emerged during the dark age of the sixteenth century BC from West Luwian-speaking Indo-European origins. The Luwian language group which included Arzawa's inhabitants seems to have been the first to begin a migration away from the original Indo-European homeland, to the north of the Black Sea and Caspian Sea, so its speakers were well settled by the time they entered the historical record. The earliest Hittite records refer both to Arzawa and neighbouring Kizzuwatna as Luwia, so it is possible that they emerged from a single territorial association (see feature link, right, for an examination of Luwian origins). The name was initially pronounced Ar-tzau-wa, and perhaps later as Ar-tzau-va (the original 'w' having been pronounced as a 'v' anyway). An 'Arzawiya' appears in the Proclamation of Telipinus, although this is only extant in later copies. The capital may have been at Zippasla (just east of Magnesia), or more likely at Apasas (possibly Ephesos on the western coast). The Arzawan state had the Hittites as its immediate neighbour to the east, and the barbarian Kaskans and Indo-European Pala to the north. Mycenaean colonies soon began to appear on the western coastline (including, perhaps, Ahhiyawa), and in the mid to late fourteenth century BC the minor Luwian state (or vassal region) of Lukka lay to the immediate south. The north-western region of Wilusa was apparently Arzawan (at least in later years), but may have been independent of the Arzawan state itself as it traditionally maintained friendly relations with the Hittites (unlike Arzawa itself in several periods). Initially, during the fifteenth century BC at least, the rulers of Arzawa were counted amongst the 'great kings' of the day. However, letters from Arzawa were written in the Hittite language instead of the otherwise universally-used Babylonian cuneiform, revealing the fact that the state court was not fully integrated into the existing 'international system' and had a secondary status to its more powerful neighbour, the Hittite empire. Eventual conquest by the Hittites removed it from the international picture, and no major Arzawan sites have so far been found by archaeologists. Like other Luwians, the Arzawans chiefly worshipped the storm god (Teshub in Hurrian - later on the Greek Zeus took on the storm god's role). They called him 'Tarhun' but this was rendered as 'Tarhunta' in theophoric names. Both the name Arzawa with its 'art-' pronunciation and the fact that Tarhun was worshipped mark out the Luwians as followers of the Arte/Rte cult which survived in Zoroastrianism as the practical philosophy of Asha. This following was especially strong in Indo-Iranians/Indo-Aryans, but also to a degree in early Germanics. The fact that it survived in the South Indo-Europeans who entered Anatolia marks it out as a very old practice, one which predated the first migrations out of the original Indo-European homeland no later than 3500 BC (see feature link, right, for a much deeper examination of this following and how it may even have provided Asia with its name). Another god was Uhha, as seen in the names Uhha-Muwa ('Uhha's Might') and Uhha-Ziti ('Uhha's Man'). When the Arzawans agreed treaties with the Hittites, they also called the river and mountain gods to witness. Another element that appears in personal names is 'Kurunta', often under the Sumerograms 'KAL' and 'LAMMA'. 'Kurunta' alone became a personal name for a later prince of the kingdom of Tarhuntassa, which was founded by Luwians, so it seems likely that Kurunta was a local hero as much as a god (like Heracles to the Greeks). Tarhun stands out as being another contraction of 'tu arun', meaning 'your protector'. Other pronunciations of this asura god are Varuna, Ouranos, Taranis and, of course, the Germanic contracted form of Thor. This presence of an asura in an Anatolian branch of Indo-Europeans is intriguing. Either the cult was borrowed, or the god is so old that it dates back to a time at which all branches of IEs were in contact with one another - ie. somewhere around a date of 4000-4500 BC at the latest. Some time after this point the Luwians settle in Anatolia, just to the south of the (probably indigenous) Hatti. The Luwians are Indo-Europeans of the southern group - generally agreed to have been the first group to migrate out of the original Indo-European homeland to the north of the Black Sea and Caspian Sea. The route they have taken in their migration is open to interpretation (and guesswork! ), but a route through the Caucuses seems most likely, followed by a more easterly route around the eastern shores of the Caspian Sea. Once in the region of north-eastern Anatolia they will have settled into a semi-nomadic existence for a couple of millennia, before migrating westwards during an intense dry spell into Anatolia itself and settling permanently from about 2300 BC onwards. Once there, the Luwians form two major regional states, Arzawa and Kizzuwatna (possibly a single state or region initially, which only later divides into two states). Western Luwians also quickly expand into the western Anatolian coastal regions, infiltrating and dominating native Anatolian populations in regions such as Dardania. It seems more than coincidental that 'barbarians from the north' are causing problems in cities within Syria such as Ebla at the same time as the Gutians are first mentioned. These are possible Indo-European tribes who inhabit the Zagros Mountains. In the same period, the Luwians are settling across southern Anatolia, making it likely that one of these groups is responsible for probing expeditions farther south. The fairly new Hittite state to the east invades Arzawa, which itself is apparently already in existence by this time. However, records of this attack survive only in much later copies (a late fourteenth century BC treaty of Muwatallis II to Alexandros of Wilusa refers to it), so the use of Arzawa may be an error or the reference may be inaccurate. However, the eastern Luwian state of Kizzuwatna does exist by this time. Arzawa (or Assuwa) certainly has been established by this period. It consists of the south-western corner of Anatolia, plus a wide strip of the Mediterranean coastline up to the border of Kizzuwatna (roughly in the region of Mersin in modern Turkey), some of which later emerges as Tarhuntassa. The Lukka exist to the immediate south, on the Mediterranean coast, while Ahhiyawa begins to be mentioned as occupying the Aegean coast. Some evidence of kingship also emerges, albeit only because the king of this period comes into conflict with a Hittite ally (see map, below, for specific locations). Eventually replaced by Madduwattas (after dying perhaps?). Arzawa concludes a treaty with the Hittite king, Tudhaliya II (I). However, according to an internal Hittite memo, the 'Indictment of Madduwattas', by Tudhaliya's heir, Arnuwanda I, one Madduwattas appears to be in regular conflict with Kupanta-Kurunta from his Hittite-supported mountain kingdom of Zippasla. Madduwattas is regularly defeated by the Arzawan king, so a Hittite army is moved into Zippasla to provide a permanent garrison. With the kingdom at last secure against Kupanta-Kurunta, Madduwattas apparently now decides that he is never again going to suffer such indignities as his many defeats. When Dalawa (Tlawa of the Lukka, classical Tlos) and Hinduwa rebel (against him or Kupanta-Kurunta? ), Madduwattas suggests to the Hittite army commander, Kisnapili, that he takes Hinduwa while Madduwattas takes Dalawa. But while Kisnapili is on his way to Hinduwa, Madduwattas allies himself to Dalawa and, with its help, he ambushes and kills Kisnapili. King in Zippasla, then Alashiya, and finally all of Arzawa. Subsequently Madduwattas marries the daughter of Kupanta-Kurunta and then wins the Arzawan throne itself (the circumstances are unclear). Then he moves his capital into Arzawa proper and enlarges this state in its western Anatolian holdings. When Tudhaliya orders Madduwattas to put down a revolt in Happalla, he does so, but then forces Happalla to switch its loyalty to him. Then he bullies Pitassa into his kingdom, which brings Arzawa's borders even closer to the Hittite heartland. Under Tudhaliya's hapless successor, Arnuwandas I, Madduwattas even allies himself with his old foe, Attarsiyya of Ahhiyawa, and invades Alashiya (on Cyprus). Madduwattas now holds the whole of western Anatolia. However, Attarsiyya soon takes Alashiya for himself and Madduwattas is kicked out (his military skills are demonstrably pitiful!). He still rules Arzawa, and is able to pass on a strong kingdom to his successor. Tarhundaradus is the next named king, but the gap between his period and that of Madduwattas is too great. There must be at least one missing king in between them. As for Zippasla, the name fades from history, suggesting that it is nothing more than Madduwattas' personal stronghold. One or more unknown kings? 'Great King'. Expanded the kingdom to its greatest extent. 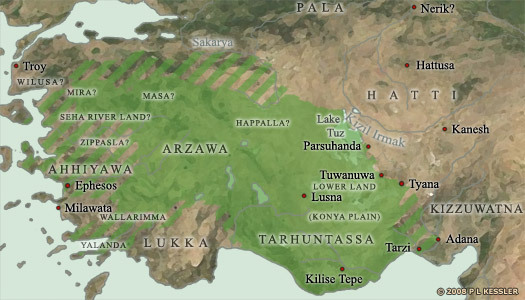 Stronger than Hittite king Tudhaliya IV (III), Tarhundaradus redraws Arzawa's frontier to a line between Tuwanuwa and Tyana, a hundred miles to the south of Hattusa, and along to Uda. With the king being a contributor to the Egyptian Amarna letters, Arzawa still uses the Hittite language. Egypt attempts to weaken the Hittites (or recognises that they may have ceased to exist as a viable state) by establishing good relations and proposing a diplomatic marriage with Arzawa, as well as requesting some of the Kaskan people of whom the pharaoh has heard. Apparently, Arzawa is strong enough to reach past the Hittites and take Kaskan prisoners for itself. The Hittites under Suppiluliuma eventually manage to destroy the Arzawan fort of Sallapare and retake Tuwanuwa, thought to be on Arzawa's eastern edge. Arzawa also loses its eastern coastal strip of Tarhuntassa at around the same time (the first part of that name bears a startling similarity to the first part of the Arzawan king's own name). However, the state still holds the rest of its territory intact, which seems to be made up of a series of tribal areas according to Hittite documents (it is possible that it always remains this way, as witnessed by the later regional feuding within the state). Stood against Hittites but was defeated. Anzapahhadu routs an incursion under the Hittite general, Himuili, but succumbs to the next one under Suppiluliuma. Arzawa seems to fragment to an extent. Non-Hittite rulers emerge in various locations within the state, and rule independently of one another and in continual conflict with each other. Probably the northernmost, the kingdom of Mira borders the Arzawan state of Masa (ruler unknown until about 1323 BC, but possibly the later kingdom of Mysia) and the kingdom of Wilusa, while south of it is the Seha River Land kingdom (the River Seha can tentatively be identified with the classical Hermos, the modern Gediz). Remained king during 'northern borderland' period, below? A period begins here which can be labelled the 'northern borderland' period. Muwa-Walwis is king of the Seha River Land in north-western Arzawa. The name meaning 'Lion-Might', he is probably renowned for his courage and success in battle. Whether he remains a subject of the Arzawan king is entirely speculative as no records survive to support a theory, but he is clearly an important figure. He may be responsible for carving out a territory of his own along much of Arzawa's northern border which includes Mira and Happalla, and following his death his sons vie for control of the entire territory. King of the Seha River Land. Muwa-Walwis or Muwawalwi ('muwa' meaning 'might' and 'walwis' meaning 'lion', extrapolated to produce something descriptive such as 'mighty lion') bequeaths his territory to Manappa-Tarhunta, probably one of his younger sons, leaving the others to plot in secret. They all seem to have minor kingdoms of their own, all along Arzawa's northern borders, but perhaps the Seha River Land is their homeland and the other holdings are lesser positions. The various usurpations and restorations become quite complicated during this period as the brothers vie for superiority amidst continual Hittite interference. Son. King of the Seha River Land. His throne briefly usurped. Brother. King of Mira. Forced to flee. Returned as Hittite ally. Mashhiuiluwa's brothers besiege him at Mira and force him to flee to the Hittite capital. One of these brothers has a son named Kupanta-Kurunta after the Arzawan who had previously stood up to the Hittites (around1430 BC), and it is this Kupanta-Kurunta who is installed as king of Mira. Suppiluliumas of the Hittites is quite aware that this revolt is dangerous for his frontier so he marries his daughter Muwatti to Mashhiuiluwa, after which the couple return to Mira. Precisely when and how Mashhiuiluwa regains his throne is unclear, but this does indeed appear to take place. In the meantime, Manapa-Tarhunta's brothers, led by Ura-Tarhunta, plot to kill him, but he escapes to Karkissa (Caria), and Ura-Tarhunta claims his throne. With Suppiluliumas now dead, Hittite joint king Mursili II tries writing to Ura-Tarhunta but is ignored. Both Mursili and his incapacitated brother, Arnuwanda II, then both write to the men of Karkissa, asking them to keep Manapa-Tarhunta safe. From this point onwards, some dates given for Arzawan kings appear to be too generous, with the state falling around 1250 BC in this timeline. In opposition to this is a well-documented campaign, contained within the 'Ten Year Annals', by the young Hittite king, Mursili II. He invades Arzawa and captures it within two years. Given that his reign ends around 1308 BC, the Arzawan dates have been compressed to fall into line (the alternative, too-generous dates are shown in parenthesis). Brother. Usurper king of the Seha River Land. Deposed. Ura-Tarhunta has proven to be both an ineffectual and unpopular usurper, and his subjects are clearly becoming unhappy with him in command. The incapacitated Hittite joint king, Arnuwanda II, lives long enough to witness a revolt throw out Ura-Tarhunta and reinstall Manapa-Tarhunta. Restored to the throne of the Seha River Land. Restored to the throne of Mira as a Hittite ally. Removed. Took over the main body of Arzawa. Incapacitated c.1326 BC. (Or c.1310-1270 BC.) Uhhaziti clearly causes the Hittites problems. They label him a rebel, probably because he manages to reunify much of Arzawa in the face of their likely attempts to keep it fragmented, and even allying himself with Ahhiyawa. Manappa-Tarhunta (the Seha River Land king) is clearly a client of his, so it is likely that the other kings of the northern borderlands are also clients. His base is the city of Apasas, a western port town (possibly Ephesos, due to the phonetic similarity). (Or c.1250 BC or, perhaps more realistically, c.1306-1305 BC.) Devoting attention to areas of Anatolia which had been ignored by his father, Hittite King Mursili II and his brother, the king of Carchemish, invade Arzawa. Mashhiuiluwa of Mira reports that King Uhhaziti is incapacitated, so Mursili attacks the allied Ahhiyawan forces. Piyama-Kurunta and his father have long struggled to keep the Hittites out of Arzawa but after the death of Uhhaziti, his son eventually realises that his cause is lost. He surrenders and is deported to Hattusa. After having spent a second year in the region, mopping up resistance, especially around the Seha River Land territory, Mursili II signs a treaty with the minor Arzawan kingdoms of Mira (with Kuwaliya now attached), Happalla (or Hapalla), and Seha River Land (with Appawiya attached). He recognises their occupants as free men and, of course, Hittite clients. Each kingdom receives a new king in the form of an Arzawan prince (quite possibly the existing kings reinstalled, but now as Hittite subjects), with loyalty gained by treaty and through inducements. Arzawa disappears as a cohesive state. However, it retains a special status even as a Hittite subject. Client king of Masa (between Mira & Wilusa). Killed by Mursili? Mashhiuiluwa of Mira joins up with an otherwise unknown king of Masa in Arzawa in rebellion against Mursili II. The Hittite king invades Masa and Mira, causing great damage in the latter. The king of Masa is presumably killed and Mashhiuiluwa is handed over by the dead king's people, to be deported back to Hattusa. His adopted son, the usurping Kupanta-Kurunta of about 1336 BC, is handed the throne. Client king of Mira. Survived into Hattusili III's reign. Perhaps initially being king in Happalla before being replaced by Ura-Hattusa, Tarkasnawa may be responsible for creating a strong state in Mira which, to a degree' recaptures some of Arzawa's former glory. Shown in his digraphic silver seal as Tarkondemos, he seems to establish himself as a figure comparable to the near-contemporary Karunta of Tarhuntassa who is able to seize the Hittite throne for a few years. He is addressed with the same 'Great King' courtesies as his forebear, Tarhundaradus (fl c.1370 BC). Brother. King? Seized Wilusa. Overthrown by Hittites. Piyama-Radu is mentioned in connection with Arzawa and Wilusa, and apparently seizes the throne of the latter before being overthrown by the Hittites. Whether he is a king in part of Arzawa who has been pushed aside by the Hittites or perhaps a member of a royal house is not known, but he does seem to have the intention of asserting a rightful status to rule. At Mira, Kupanta-Kurunta is considered to be a Hittite family member so Alaksandu of Wilusa is duty-bound to help him even against his own people if need be. The kingdom of Masa (on Wilusa's south-eastern border) attacks Alaksandu and is destroyed (again) by the Hittite king, Muwatalli II. The Hittite prince, Hattusili III, deposes Mursili III and establishes his own powerbase in Arzawa, where he is supported by the populace. Hattusili makes Mursili's son, Karunta, 'king of Tarhuntassa', while exiling Mursili himself. With the Hittites now firmly in control of Arzawa, specific mentions of it in contemporary documents seem to fade out almost entirely. The only subsequent incident of note is a client king of the Seha River Land (showing that the client kings continue to hold office in at least one of the 'northern borderland' territories) who causes some problems for the Hittites during the reign of Tudhaliya V (IV). The Hittite king himself may be deposed for a short period, so his rule could possibly witness a period of comparative weakness for the Hittites. Client king of the Seha River Land. Stirred up trouble. Tudhaliya V (IV) of the Hittites complains that Ahhiyawa is behind rumblings of trouble from Tarhuna-Radu in the Seha River Land. The Hittites have repeatedly asked Ahhiyawa's king for cooperation in maintaining stability in western Anatolia but, whatever the unrecorded response, the pleas seem not to lead to any reduced insurrectionist activity in the western Hittite states: '...Thereafter, Tarhuna-Radu waged war [against the Hittites] and relied on the king of Ahhiyawa [for support]. And he took refuge on Eagle Peak (ie. Mount Harana)'. Tarhuna-Radu faces a Hittite military expedition led by the king in person (the first such visit since Arzawa's fall) which raids Eagle Peak, captures him, his family, and followers, and ships them all eastwards. An unnamed descendant of Muwa-Walwis is placed in command of the Seha River Land, possibly the last such client king before disaster falls upon Hittite Anatolia. Unnamed successor client king of the Seha River Land. Decaying from late in the thirteenth century BC, as Assyria rises and instability grips the Mediterranean coast, the Hittite empire is looted and destroyed by various surrounding peoples, including the Kaskans and the Sea Peoples (and perhaps even selectively by its own populace). 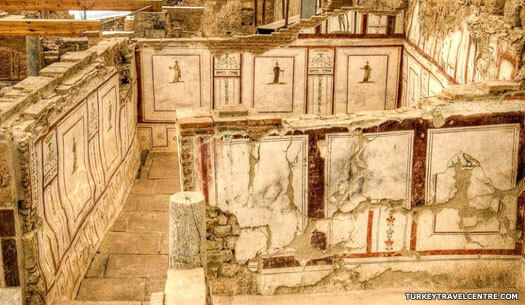 Arzawa would also appear to be a victim of the Sea Peoples and is largely abandoned for at least a century. In part the neo-Hittite kingdom of Maeonia emerges to take Arzawa's place, along with the Phrygian kingdom, while there is the slight possibility that, given its probable position in the north of Arzawa, the sub-kingdom of Masa may in fact be the kingdom of Mysia, which survives a little longer.